After two decades in the study and practice of medicine, Sarah Seidelmann took a three month sabbatical to search for a way to feel good again. Having witnessed human suffering early in her career and within her own family, she longed for a way to address more than just the physical needs of her patients and to live in a lighter, more conscious way. 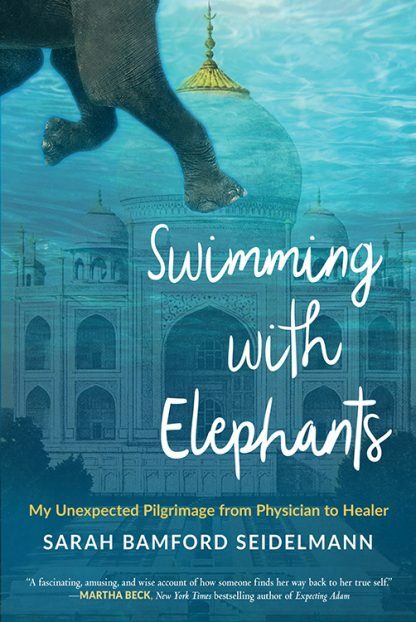 Swimming with Elephants tells the eccentric, sometimes poignant, and occasionally hilarious experience of a working mother undergoing a bewildering vocational shift from physician to shamanic healer. During that tumultuous period of answering her call, Sarah met an elephant who would become an important spirit companion on her journey, had bones thrown for her by a shaman in South Africa, and traveled to India for an ancient Hindu pilgrimage, where she received the blessing she had been longing for. Ultimately, she discovered an entirely different way of healing, one that she had always aspired to, and that enabled her to help those who are suffering. Sarah Bamford Seidelmann is a fourth-generation physician turned shamanic healer and life coach, who deeply enjoys shenanigans. She�s a frequent guest blogger at Maria Shriver�s site for Architects of Change and has led sold-out retreats combining surfing and shamanism in Hawaii and a sacred pachydermal pilgrimage to Thailand. She loves to help others find their own �feel good� so they can live courageously and enthusiastically.